When I attended university, oh so many years ago, I had the chance to speak with Ken Kesey on the phone. He had agreed to have a chat about the Merry Pranksters for a presentation I was due to give. I put off calling him because I was nervous of asking the wrong questions or coming across as ill-informed about the counter-culture movement. I kept putting off the call and eventually I let too much time elapse from my initial enquiry to his office and I missed my chance to speak with him. I regretted this a few weeks later when he passed away. 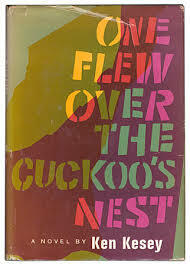 One Flew Over the Cuckoo’s Nest is a wonderful novel, influenced by Kesey’s experimentation with LSD it is a fairly conventional narrative and it is lucid in its hard hitting damnation of the “system”. It is a powerful and poignant book and it is one of my favourites. You know, I’ve never read this, I’ve seen and loved the movie numerous times since I was kid. Maybe it’s time to add the book to my reading challenge, after all the book is always better than the movie in my opinion. The movie is superb and is pretty faithful to the book but the book is well worth reading. It is definitely more from the perspective of the Chief and it is brilliant..
I’ve never read the book, but the film was pivotal for me, and one of the reasons why I read for my first degree in psychology. I’m sure the book is very different from the movie. It allows for nuance and subtlety.